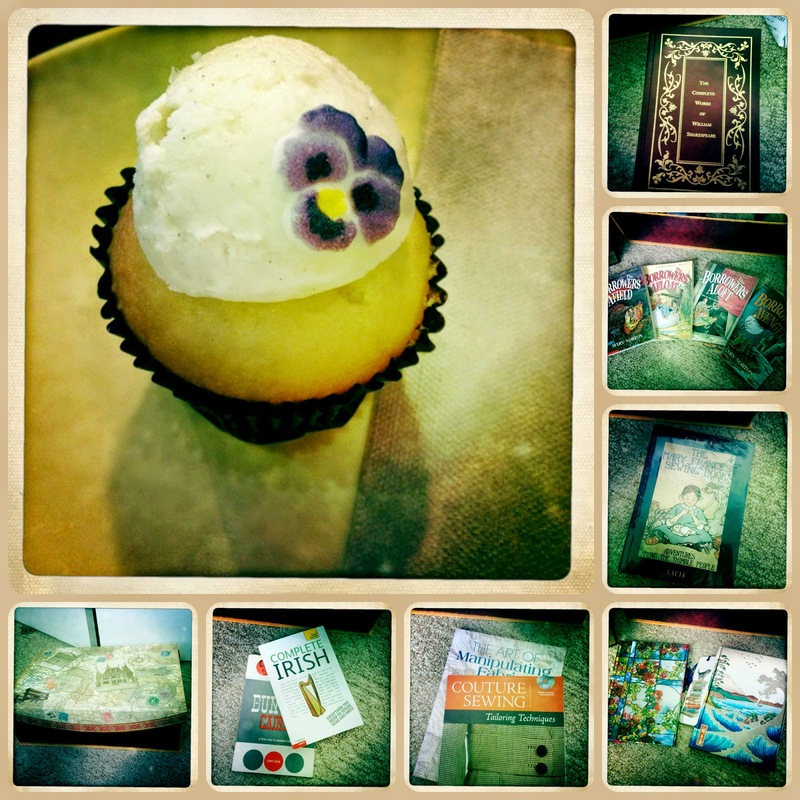 My Birthday, The Hollow Crown, Knitting, and Etc. I do not want to write a review of The Hollow Crown (the first play is overwhelmingly evil, and the last two are painfully wonderful; this is my mini-review), but since I mentioned The Hollow Crown previously, I feel duty compelled to give a warning as there are content issues in all (in varying intensities). If you are super oblivious, perhaps you could avoid reading and miss the problems; if you read warnings you will catch the problems. ANYWAY. Back to not-mind-contorting fun. I have four (yes, FOUR!!!) 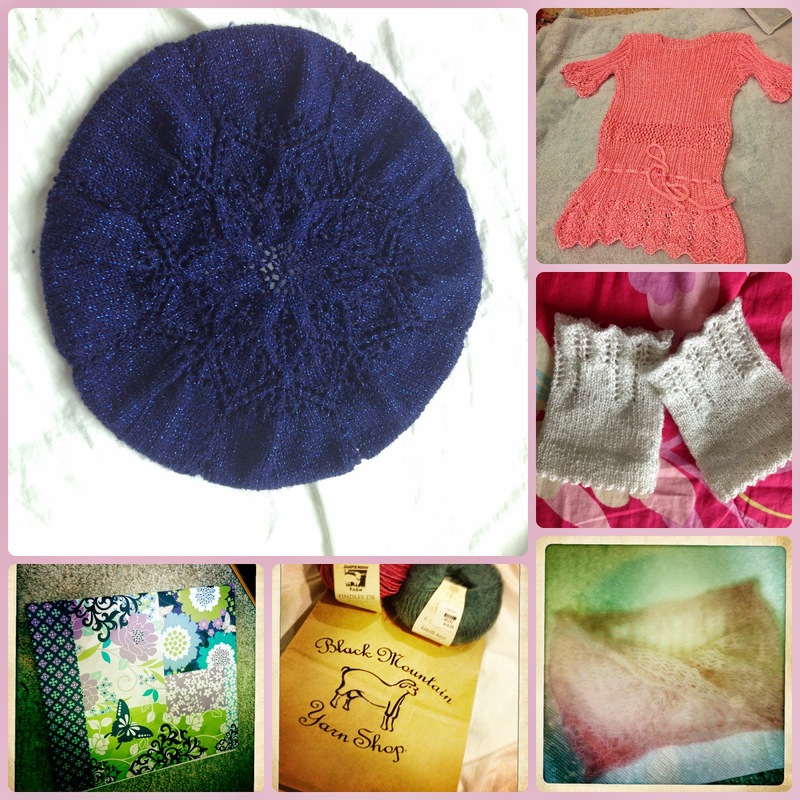 finished knitting projects to show. This also means that I have only three in my unfinished/will do soon category before I can start on new projects. The last beret! I like this pattern best (Little Flower Beret or Tam). The beret is larger, the head band area is smaller (less like a beanie, ugh, girls should NEVER wear beanies-so unfeminine, and only a few types of guys can pull them off), and the design is gorgeous (I purposely used this my-least-favorite yarn for the prettiest pattern) . . . even though hard to see because of the color. Next is the forever pink sweater which is quite tight but can at least go on me. If I tried this pattern again, I would need to go up a size. I think I might want to go up another size more and downsize on the needles since I prefer a tighter knit. The neckline is too tight and not flattering period; I would make it more of a scoop. White cuffs (Hetty’s Sunday Cuffs from the Jane Austen Knits magazine, May 2012; also available to purchase and download here) to match the white beret for my youngest sister. I had to go up a needle size and probably could have gone up another. I knit tight, but I think these also must have been sized small because the cuffs are still tight. I mean I know we have largish hands in our family, but I do not have issues with the fingerless glove patterns I have tried. Pink cowl for a gift (part of my longest ever gift procrastination . . . think like a decade :/). Do not look closely at this. I found this changing project irritating for a variety of reasons and so made up a stitch pattern and did not try to remedy all the mistakes (which it is a pain and sometimes danger to do with this yarn because it is easily destroyed). Oh, and despite the weird tinge of my iPhone app photo, the cowl is really just a light cotton candy pink. I bought a lovely binder, so I can carefully store all my patterns in page protectors instead of dragging around the paper/magazines/leaflets and destroying them. I turned 24 recently, so we had a girls’ shopping day. I picked out loads of items from Half-Price and that was my gift from Mom. My brother gave me a Kohl’s gift card and my grandparents $50 (yarn?!) and a blouse. The cupcake is from Panera where we had lunch. Oh, and the box I bought from T.J. Maxx. I love these types of boxes. They are so elegant.